Ushahidi uses online workers to map out disaster areas and solicits volunteers to help prepare for future disaster scenarios. (CNN) -- In the aftermath of disasters like the earthquakes in Haiti and Chile or the massive floods in Pakistan, it's easy to feel helpless. If you're in the United States, those disasters may seem a world away. What can a person do to chip in? More than you might think. Take the group Ushahidi, which has opened eyes by using online volunteers to map out disaster areas more quickly and effectively than governments can. Ushahidi develops interactive online maps, updated during crises with real-time information, and solicits volunteers to help it prepare for future disaster scenarios. CNN spoke with Patrick Meier, the group's director of crisis mapping, about what "crowdmapping" is, exactly, and how people can learn to help. "Crowdmapping" refers to the action of many people coming together over the internet to create a digital map that is as up-to-date as possible. In a disaster situation, the timeliness of the map is critical, because the needs and locations of earthquake victims, for example, change rapidly. A small army of volunteers works to collect information to put on the map. Ushahidi pulls some of this data in from official sources, like the United Nations, but has really found its power in curating Twitter posts, e-mails and text messages from disaster sites. Once this information is collected, volunteers collaborate over the internet to put each post onto a map, which is updated second by second. This lets on-the-ground officials locate people with the most critical needs and deliver medical and humanitarian relief more quickly and efficiently. Before groups like Ushahidi, the flow of text messages and Twitter posts from disaster sites was not used as widely to gauge the severity and layout of disasters. Knowing how to send out information if you're at the scene of a disaster is one way to help, Meier said. The general rule of thumb is this: The more information about the disaster you can make public -- either through posts to the internet or text messages -- the better chance that the information will make its way to someone who can help. Including your location and most critical need is important, Meier said. If you're posting to Twitter or another public website, make keywords like location and need into hashtags by putting the "#" symbol in front of them. A standardized syntax for these post-disaster communications is starting to emerge based on these hashtag conventions. Project EPIC, from the University of Colorado, has developed a short guide to tweeting after a disaster. Here's an example of a post from the aftermath of the Haiti earthquake. Original: Altagrace Pierre needs help at Delmas 14 House no. 14. With proper syntax: #haiti #name Altagrace Pierre #need help #loc Delmas 14 House no. 14. The tags make it easier for computers and people to find the information they're looking for, and categorize it, quickly. Also, an Ushahidi app, currently available for Android and Windows phones and due out on the iPhone by the end of October, takes the guesswork out by letting people fill in forms with pertinent information. The app also helps people attach other useful information -- like photos and GPS coordinates -- to their pleas for help. People who aren't in the disaster area can help crowdmap the mountains of data that come back from these posts and other sources. Ushahidi uses volunteers to translate text messages into English (1,500 people, located in far-flung places like Norway and South Africa, worked to translate texts from Haitian Creole after the January earthquake, Meier said); to scour media reports for location-specific information about a disaster's impact; to collect text messages; to field e-mails; to plot these data points on a map; and to develop the technical software that makes all this work. You don't need specific technical skills to volunteer, Meier said -- only a computer, an internet connection and a willingness to help. People who sign up take a survey to identify their relevant skills. PowerPoint presentations and YouTube videos guide volunteers through their specific tasks once they're assigned. 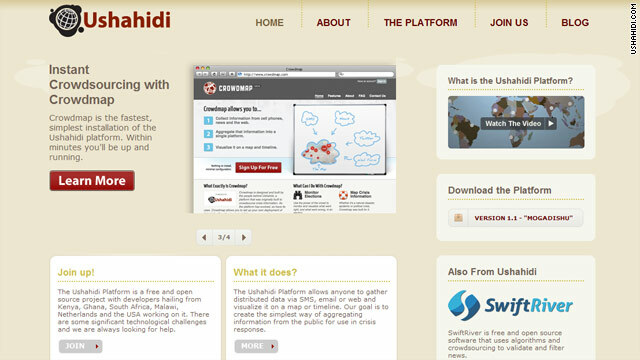 To inquire about working with Ushahidi, send an e-mail to join@standbytaskforce.com.